"ZOLLIE GOES WEST" is the first of a planned series of children's books that provides an entertaining way to teach and reinforce vital life lessons. Zollie, the zebra, travels to a new land in hopes of learning about others and teaches Herbie a very special lesson while hiking the trail to Gopher's Gulch. Created to be a very effective educational tool in the hands of parents, grandparents, teachers, etc., Zollie is best introduced to children in their early school years. 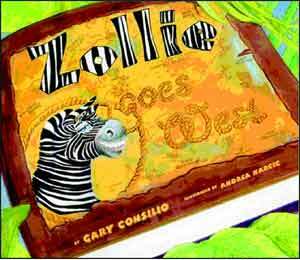 Zollie, the zebra, who has a vivid imagination fueled by reading, teaches children (and reminds adults) about the importance of understanding, respecting and accepting others, without condition. He further teaches that regardless of age, ability or appearance, all of us have value and we are all important. As adults, we need to do a better job of instilling in our children the ability and the willingness to respectfully interact with people, regardless of social, cultural, religious, or political differences. We can no longer neglect the responsibility, nor assume these lessons will be taught and learned, unless each of us shares in this obligation. In doing so, this will help our children develop at an early age, a better understanding of their eventual role/place in an ever changing global society. Hopefully, this under-standing will help prevent a repeat of the devastatingly horrific Holocaust, the tragic events of Sept. 11th, and the continuation of racial prejudice. More than ever, we all owe this to our children as we try to prepare and assist them in their integration into the world community. The zebra is the most recognized animal throughout the world and easily identified by children. The Zollie book series will teach respect, compassion, honesty, and integrity and en-courage people to be more involved and supportive of any and all worthwhile causes, whether it is a charity, an organization, or a family in need. Zollie the zebra is Gary's way of paying tribute to a man he met and worked for in Chicago Mr. Zolie Frank was a very special man who owned the largest auto dealership in the world. Mr. Frank's philosophy at his dealership was "When it comes to buying a car, we speak your language." He backed up this statement by advertising in approximately 30 ethnic papers everyday. Mr. Frank never preached about diversity and respect, but by amassing a diverse sales force, everyone learned about each other and the environment created an amazing collection of friends. Mr. Frank would tell them that if they worked hard, he would guarantee financial success and in return he asked one thing - whenever he drew attention to a worthwhile cause or organization, he expected them to back him 100%, because 95% would never be good enough at Z Frank Chevrolet. He further taught that whenever you have a chance to show compassion, just do it. After working for Mr. Frank for three years and witnessing countless displays of 100% support for him, Gary promised that he would find a way to say thank you to Mr. Frank for the example he set and the lessons he taught. As Gary watched the tragedy of September 11, 2001 unfold, he remembered thinking that he was not able to change the world, but with his gift for writing and public speaking, he could make a difference, even it if meant one person at a time. Zollie the zebra was created to teach vital life lessons while paying tribute to Mr. Frank. Just like Mr. Frank, Gary does not believe in thinking small - he is an active motivational speaker and author and has done over 230 community events as book signings and fundraisers for non-profit organizations such as the American Cancer Society, Make-A-Wish Foundation, Rainbow Babies and Children's Hospital, etc. 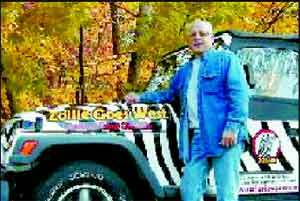 Gary's favorite way to draw attention to his mission and fundraising efforts is by driving the famous Zebra Jeep. For each book sold during December and January, $5 will be donated to The Gathering Place, a caring community that supports, educates and empowers individuals and families of Northeast Ohio touched by cancer through programs and services provided free of charge. For this special fundraiser for The Gathering Place, all books MUST be ordered on the Zollie website, www.zollie.net or by calling Gary at 216.272.5050. After January, click the link below to buy from Amazon.